I was watching TV the other night when the fact that I had a beautiful, unopened jar of raw tahini in the back of the pantry suddenly dawned on me. This happens to me often. Very often. So this is what happened to me as I was binge-watching The Crown. My brain begged me to stop paying attention to who-is-related-to-who and what-affiliation-and-title-so-and-so-has and to start paying attention to tahini. 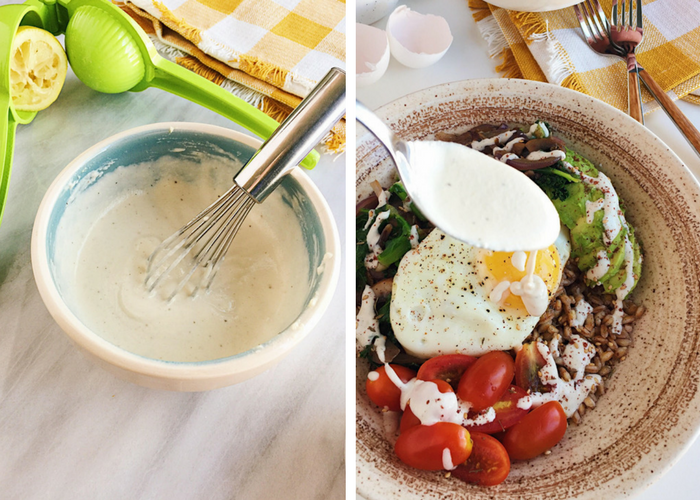 Creamy, delicious, raw tahini. And what to pair it with. My brain: Lemon. Definitely something lemony. Ooo, with za’atar. Have I ever made za’atar before? Could I find all the ingredients I needed? What should I pair it with? A wrap? Maybe something for breakfast! That would be fun and a little different. But with what? Wait is he having an affair with her? When did that start happening? Queen Elizabeth had such amazing style. When are they going to show a freakin’ Corgi?! Oh, a grain bowl! I’ll make a grain bowl. With rice? No… maybe quinoa… oh, FARRO! Farro is so delicious. Oo, CORGI! But yes. 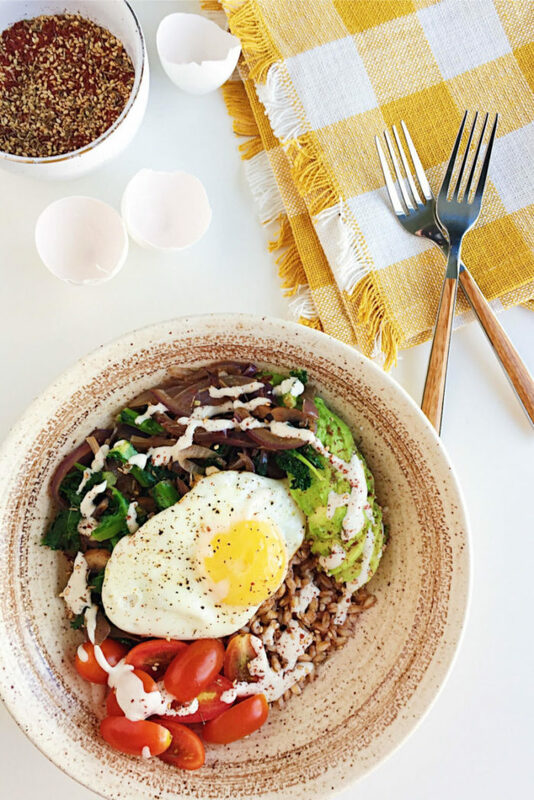 That’s the story of how these Za’atar and Lemon Tahini Farro Breakfast Bowls were born. Amidst the viewing of a Netflix original and the fact that my relentless brain will never leave me alone when it comes to food. Does this happen to you? You’re reading a food blog right now, so maybe it does. Isn’t food just the best? 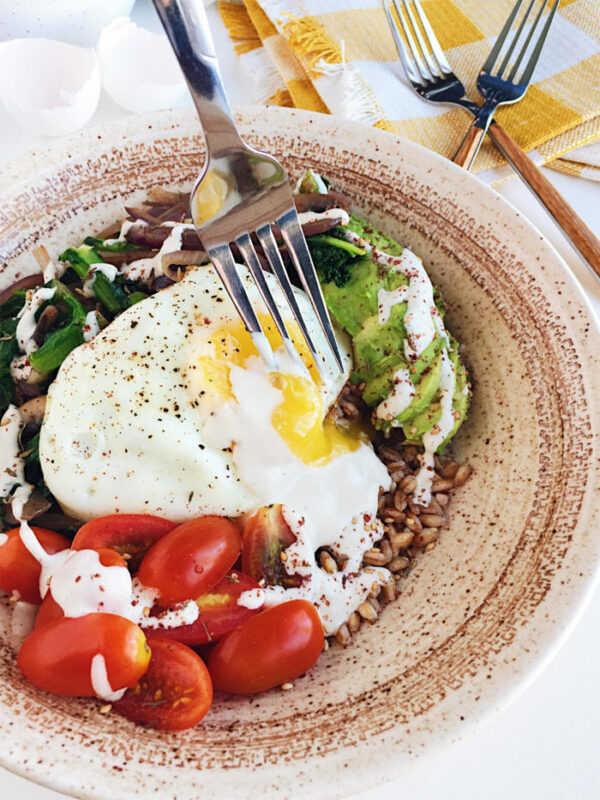 Okay, let’s discuss these farro breakfast bowls. If you’ve never had farro, now is the time to fix that. It’s a delicious and hearty ancient grain. I just described farro to someone on Instagram as “a hearty and thicker brown rice with a pleasant chewiness.” It can be used anywhere you’d use rice, oats, barley, or quinoa. The complex and nutty grain is popular in many Italian dishes. Ancient Romans used this grain to make bread and porridge and farro has been found in the tombs of Egyptian kings. Now-a-days, you can find farro used in risottos, salads, or soups. It’s easily available pretty much everywhere, but I still think it’s unjustly underrated. I find that people get intimidated about cooking farro, but there’s really no reason to. I promise. 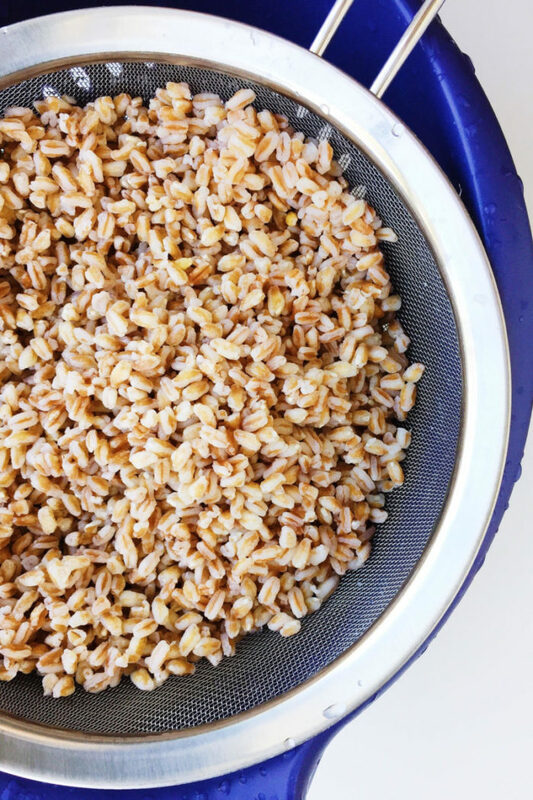 You cook farro like you would pasta, in boiling water until al dente. The farro is ready when the grain splits open and becomes white, which typically takes about 25-30 minutes. Trader Joe’s even sells a 10 Minute Farro which I love and use often. Then, for the za’atar. Za’atar is a delicious and unique blend of Middle Eastern herbs. 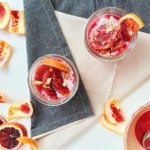 It creates this savory, bright flavor that is nutty and tart. Its stand-out ingredient is sumac, a flowering, berry-like plant which grants za’atar its distinct lemony-tart flavor. You can buy sumac at Middle Eastern groceries, most natural markets, online, or (where I tracked it down!) World Market. 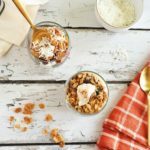 Za’atar is addictive and it’s perfect when sprinkled on hummus, paired with olive oil and pita for dipping, dusted on creamy yogurt, or in this farro breakfast bowl. I make it here with four simple ingredients: salt, sumac, thyme, and toasted sesame seeds. 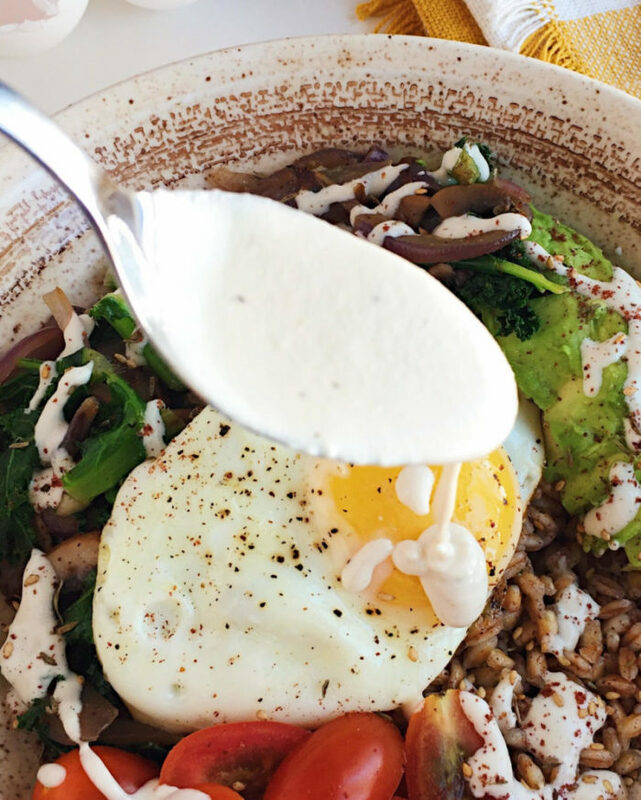 Then, we simply build our farro breakfast bowls! 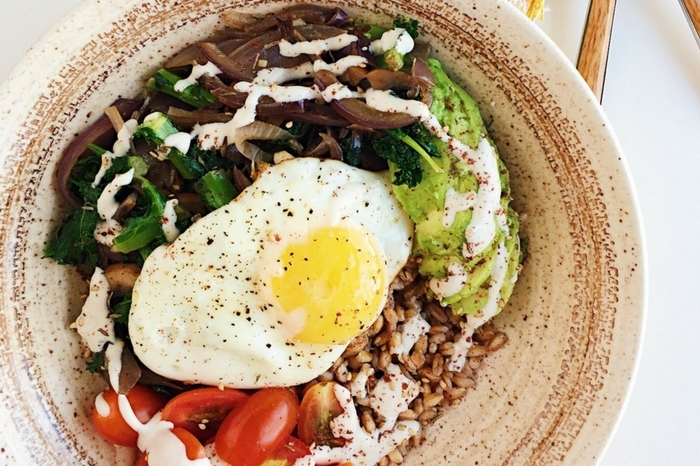 Za’atar scented farro, garlic infused kale, red onion, and mushrooms, fresh tomatoes, a 3-ingredient tahini sauce, and a perfectly fried egg compose this grain bowl. And it’s so good. And so good for you. 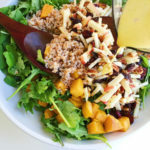 Farro offers tons of protein, fiber, magnesium, and iron. The sumac and za’atar provide an ample amount of antioxidants, vitamins, and Omega-3 fatty acids. Not to mention all the other superfoods such as garlic, kale, and mushrooms. 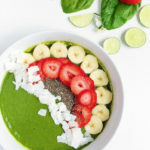 Throw on an egg for quality protein and drizzle with heart-healthy and vitamin-dense raw tahini, and you’ve got yourself a super delicious, superfood breakfast bowl. 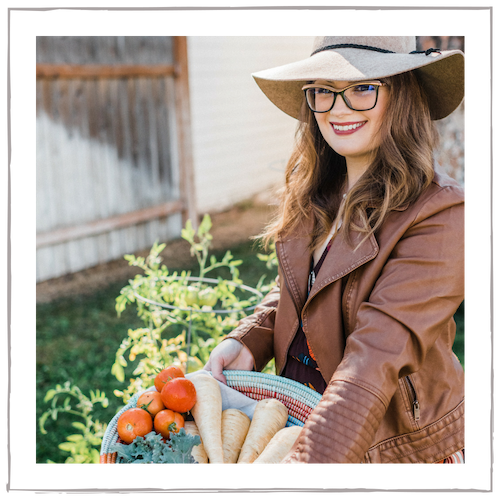 This post contains affiliate links, but (as always) are products I highly recommend. Cook 1 cup of dried farro in 3 cups of water or stock. Add rinsed farro to a pot of water/stock and bring to a boil. Reduce heat, cover, and simmer for 30 minutes, or until tender. Drain. While the farro is cooking, prepare everything else. Combine all of the ingredients and set aside. Whisk the tahini, lemon juice, sea salt, pepper, and garlic powder. Whisk in the warm water until your desired consistency. Set aside. Heat 1 tablespoon of olive oil in a saute pan and cook the onion, mushrooms, and garlic until softened. 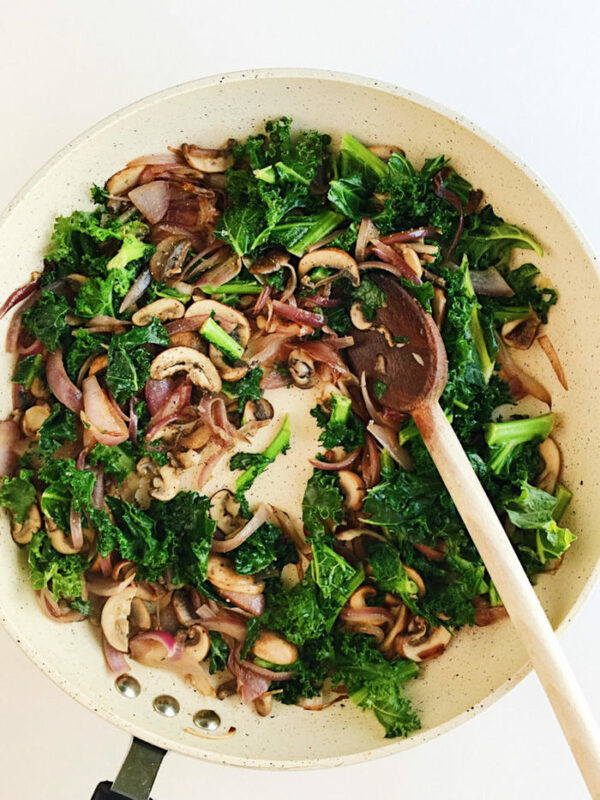 Season with sea salt and pepper and add in the kale. Cook just until wilted. Set aside. In the same pan, heat a little more olive oil or butter and fry the eggs to your liking. (Recommended: over-easy). Season with sea salt and pepper. To the cooked and drained farro, drizzle with olive oil and 1 tablespoon za’atar. Stir gently to combine well. Assemble your bowls. Divide the farro among 4 bowls. Top with the kale mixture, tomatoes, sliced avocado, and one fried egg. 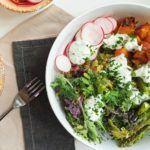 Drizzle tahini on each bowl and sprinkle with additional za’atar. Enjoy! Store leftover za’atar in an air-tight bag or container and use for topping hummus, yogurt, or dipping with olive oil and pita bread. 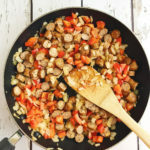 Love the varied flavors of aromatics and spices in this breakfast bow. The dish look so inviting and yummy. Your dish is perfect in itself, although I’d sub mushrooms with roasted red or yellow peppers (my favorite veggies) and top with some feta for lunch. I think this recipe will work well with quinoa, teff and brown rice. Zaatar does add a punch to many dishes. Though, quality of mixes vary a lot and many contain fillings like wheat, or even citric acid in place of sumac, and importantly very little of the real zaatar herb grown in Lebanon. That’s why I get mine from eatzaatar.com as their blends contain 30% of this herb. . Thank you for that info, Joan! That’s why I love making the spice mix myself. 🙂 I will definitely check out that site though. And yes, roasted peppers and feta would be absolutely delicious, I agree! Such an exotic looking dish, perfect for lunch too. 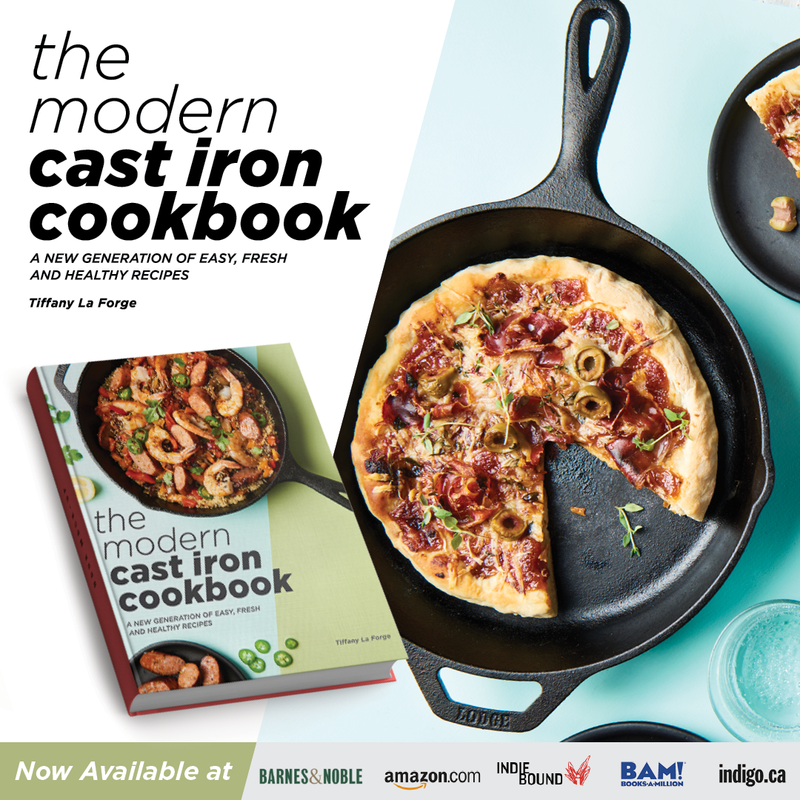 I haven’t tried farro but will look out for it! Thank you, Bintu! 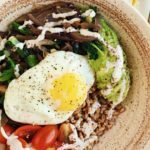 I hope you get to try farro out soon because it’s delicious! Farro is a grain that I have to taste yet. Looks delish though. Forget breakfast, I could do this recipe for lunch and dinner here on this frigid, WI day! Looks and sounds perfect. Thank you! It really does make a lovely dinner, too. 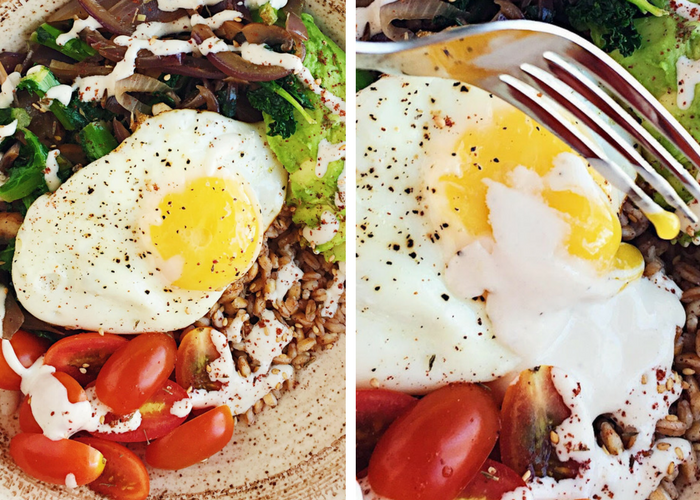 You could even substitute your favorite protein for the egg! 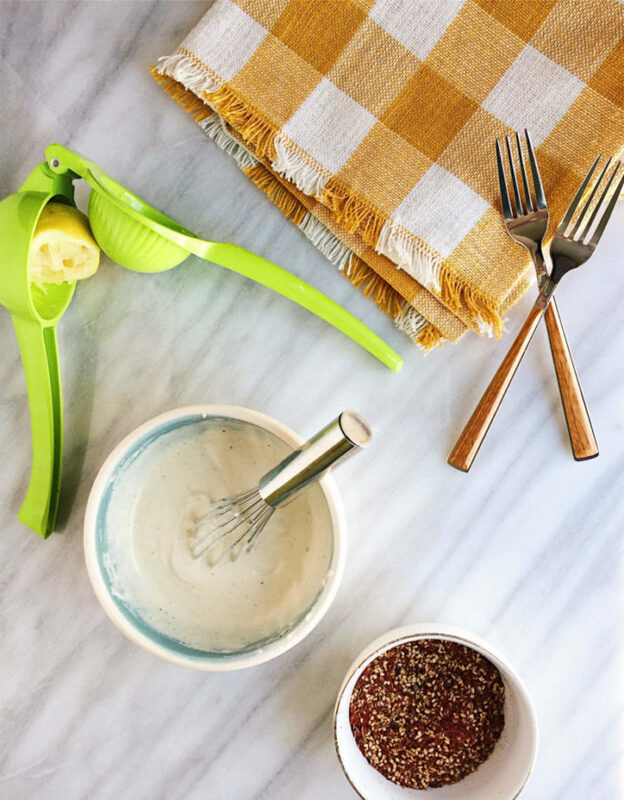 Loving those spices and that lemon tahini! Thanks, Rebecca! Pretty sure I could put tahini on nearly everything and be happy. Thank you, Bethany! I’m a huge tahini fan too! These look AMAZING! I really need to try incorporating Tahini into some of my meals. I’ve heard so much about it recently! thank you, Taylor! Tahini is so delicious on nearly everything haha. Try it in salads or in a wrap!